Correct Wheel Sizes, PCD, Offset, Rims and Tire specs for Toyota Venza series. I would like to add spacers to my factory rims to make them stand out in the rear and A little in the front but i dont want them to rub on the fenders and i wouldn't want them sticking out like a low rider. I was thinking of getting 12 mm spacers for the rear and 7 mm spacers for the fronts, what do you think ? I measured it by tying string to a washer and letting it hang from the inside of the wheel well and measured the outside of the tire to the string and that's what I came up with. Your help and knowledge would be helpful . Thank you for your time . Sorry its a 2010 venza v6 3.5 AWD with factory 20 inch rims with drilled and slotted rotors if it matters. Would i need hub spacers or no hub i would want to buy the wrong parts . Im hoping i would have some improvement in handling with body roll. Is it possible to use a 50 offset rim on my 2011 V6 Venza. It is hard to find 20 inch rims, I have a oppurtunity to by Murano rims OEM.7.5, 20inch, 50offset. My Venza rims are 7.5, 20 inch, 35 offset. both rims are 5x114.3 bolt pattern. Center on Venza is 66.1 on Murano 66.7.
hi what are the tire and rim options for my 2011 venza v6 awd? Can I use 245 60 18? I'm currently using 245/60R18 toyo snow tires with Mazda CX-7 rims. Offset is slightly off. No issues at all. I wished I had tried 17 inch rims. Finding 17s would have been so much easier. Hi I have a 2013 Venza with presently 235/65/17 what size winter rims must I have? 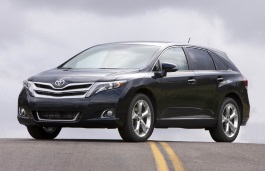 hi i like to know if i could use tires 235/55/19 for my toyota venza 2013, thanks. I have a 2009 4cyl Venza with 19 inch rims can I put. On the 20 inch Venza rims and tires? Hi,Desmond,What your current tire size? Hi, I am looking for winter tire package for Toyota Venza 2009 (20"). Could I use a 235/60r18? 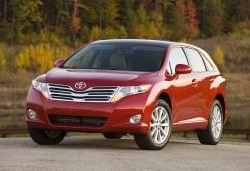 Hi, I am looking for winter tire package for Toyota Venza 2009 (19"). Are there any steel rims that will fit the Venza? Toyota says the wheels should have a 35 offset to clear the calipers. Hi,Joe,For winter tire size,Can you show your current tire size?I can help you find a compatible winter tire size.For steel rims,You'd better find a rims shop to get it because steel rims data is different alloy rims. ( 235/65R/18 on currently ) was looking top purchase 18" snow and rim from friend - he says they fit Venza/RDX/ Sante Fe...any advice ? Can I use 225/65/17 tires on 17 inches rims? Hi, Kartar ,What your current tire size?I can help you confirm it. Hi,Elicon Taruc,What the current tire size of your venza 2013 ?I can help you confirm your question. I have 2016 Toyota venza 2.7L current wheels size is 245/55/19.I would like to replace with 17 inches,what tire and rim do you recommend?